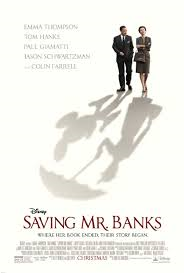 If you haven't watched the movie, "Saving Mr. Banks" I highly recommend it. It's based on the true story of Walt Disney trying to get the rights to make the movie "Mary Poppins" from the author. The author had a hard time with this because the story was so dear to her. In the movie we find out that the story was so important to her because there were some parallels between the book she wrote and her traumatic childhood. I don't know how much of what was in the movie was true or not, but I do know that often my real life issues or problems find their way into my stories. Usually not in an obvious manner but in a way that allows me to face them at a safe distant. This quote is so true. When we use stories to bring problems to life we are just trying to understand those problems from so many different angles. Most people can get that from watching movies or reading books. But writers get it from manipulating the problem and having power over it. It allows us to change the outcome or to relive the outcome. Either way, we are learning from every word we write. I wasn't going to mention this, but on my drive home California this Christmas break, I stopped at a busy gas station along the highway. I'm in my mini van with my kids and my brother and I just want to get gas and leave (I may have been PMSing a little too if I'm to be completely honest.) There are no empty pumps so the only choice is to get in line behind a vehicle already at the pump. I pulled up behind a truck. The driver wasn't there but I figured he went in to pay or something, no big deal. I waited and waited, and waited. It was 10 minutes before the came back out with his coffee and Snickers bar. I wasn't happy at that point, I mean, there are parking spaces for that, right? But when he set down his coffee and snickers bar to start pumping the gas I instantly saw red. It was downright rude. I honked at him and told him to move but he just pretended he didn't see me. I saw another spot open up and I went to that one instead. But my blood was boiling. I'm not even sure why I got so angry. It didn't really make sense, but the only thing that calmed me down on the way home was to outline a new scene in my head for my book in which my character encounters the same situation but makes a point to the rude driver. Yes, the scene will serve a purpose in furthering my character development, but it serves another purpose as well, to give me closure. Last week, I was feeling like my lungs were heavy. Like something was on my chest and it took just a little more effort to breath. Not a lot, but I thought of calling the doctor and making an appointment. Later that day, I went home and wrote for two hours (burning dinner in the process) but while I was writing something happened. That heaviness in my chest lifted. (even though the house was full of smoke from the burnt dinner.) Stress melted off of me and I felt lighter and could breath easier. That's when I realized that writing is actually imperative to my health and well being. This is what writing does for us. It gives us an outlet and control over our lives. So while I started out writing to save the world one book at a time, the truth is, I'm saving myself with each and every word I write and I thank my Father in Heaven for this gift of writing everyday. It's okay, I've had those moments too. That is definitely one of my peeves when people park at the pump! So obnoxious! I had never thought about writing as therapy, but you're right- really, whenever I create anything it helps me to calm down and that sense of satisfaction and accomplishment sends the endorphins flowing. Shortly after I was recovering from the flu I was dealing with the kids and their last few days before school started again and I was just getting stressed out. I started preparing my Singing Time lesson and I made a board with a blank snowman and cut out felt pieces to add on to him. He turned out just as I had imagined, and I suddenly just felt so much better! I wrote my miscarriage into my novel. Not literally, but the character loses a child, and her reactions are pretty direct representations of my reactions. It was cathartic, and it was desperately difficult to do. I've never re-read that scene. When I send the book to CPs and betas, I scan that section for notes or changes, but I've never once re-read it. (It never has any big notes on it, which is the sign that there's nothing that needs fixing) I can't re-read it. It gave me closure and I can't bring myself to open that wound up again. I write letters too but I usually send them which isn't always a good thing. But recently a letter I wrote to a judge got me out of a court fee. So it's not always bad!! Lol! I adore those moments of clarity when I write it out--especially things that happened YEARS ago and I see it in a totally new light and I get how it changed me as a person. There is nothing in my life that has given me more joy than writing simply because it has the power to turn everyday moments, hard moments, tedious moments, ANY moment into something beautifully meaningful. You can finally see how it fits into your life so perfectly, like it was fashioned exactly to be there--a perfect puzzle piece. It truly allows us to have a divine perspective. Writing can turn every sorrow into a joy. Just summed up my feelings in the most beautiful words possible! Thank you! My mom passed away when I was little, and in my first MS, I gave my MC my mom. I ended up cutting a bunch of those pages, and now they're just for me. I sob every time I read them, but in a good way. I highly recommend it. It's not easy, but it's cathartic.